This new sportboat is a smaller sister to the Fareast 28R, which proved a breakthrough design for Chinese builder Fareast Yachts. 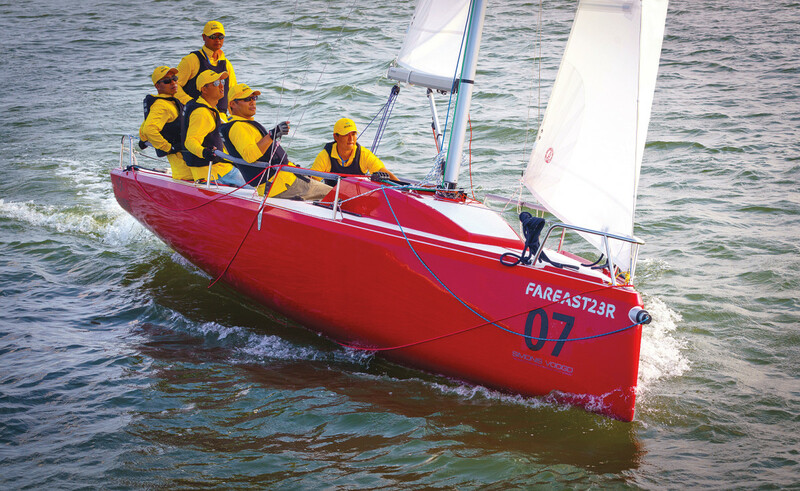 Fareast honed its chops for years producing small dinghies like the Optimist and 420 to ISAF specs, but the 28R was a proprietary design that quickly built brand recognition in Western markets. The fast, affordable, simple sportboat won lots of attention at shows and some awards as well, including a Best Boats accolade from SAIL in 2016. The new 23R takes the core concept of the 28R—a modern performance boat without grand-prix complexity and cost, but with grand-prix speed—and strips it down even more. Like the 28, the new boat boasts simple but high-quality construction, including a vacuum-infused, foam-cored hull set in polyester resin, an aluminum rig from Seldén, and quality deck hardware from Harken and Spinlock. 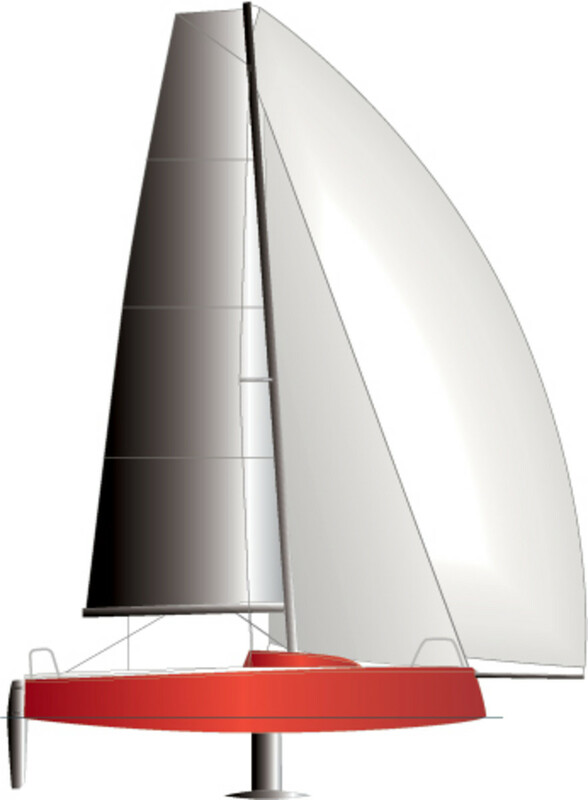 Like the 28, the 23 also carries carbon foils (a deep high-aspect rudder and a retractable T-bulb keel), a reverse destroyer bow, a retractable aluminum bowsprit and an aggressive hull form. To even further simplify the formula, though, the 23’s rig carries just a single pair of sweptback spreaders and no backstay. Its smaller size, too, helps make it more affordable, just under $35,000 for most everything you need (except a trailer). Yes, this is a simple, affordable boat, but make no mistake, it is also a powerful boat. The 23R has a generous sailplan, with nearly half of its total weight buried in its lead ballast bulb. It also has a very low D/L ratio, high SA/D ratios both upwind and down, and its velocity-prediction polars show it hitting speeds of 16 knots sailing off the wind in strong conditions. U.S. rep Matt Wake of Sturgis Boat Works tells me he has personally seen it go 18. Alas, we experienced nothing like this during our test sail on Chesapeake Bay, which was conducted in a near void of wind. I can say this, though, with complete confidence: we were hands-down the fastest boat in sight. We had no instruments, but with our big square-headed laminate mainsail and nicely shaped jib, we easily beat our way past a couple of fleets of 420s and Flying Juniors that were struggling to race. From there we tacked out as far into the bay as we dared, and then turning downwind, pulled out our sprit and launched an A-sail out of a bag hanging in the companionway. After that we ghosted most of the way back to Annapolis, dragging sheets through the water.In the end, as the wind finally went to less than zero, we had to rock and scull our way the last few hundred yards to the dock. Despite the lack of fireworks, I did still get a feel for the cockpit ergonomics, which are very good. The controls are simple, with everything falling neatly to hand, but not so simple that you cannot properly manage the sails and their shapes. There is a solid Seldén vang and a full traveler, and even a nice fine-tune mainsheet tackle within easy reach of the helm. According to Matt, the 23R was expressly designed as an inexpensive fleet boat intended to be sold in multiple numbers to sailing clubs and other institutions looking to build in-house one-design programs. That said, while it will serve admirably in such a role, it is also a boat that should appeal strongly to individuals looking for a fast, fun, affordable performance boat to race or simply blast around on.